Burdock has set up shop in what used to be Portuguese chicken resto Churrasqueira Aveirense and transformed the space into an artist-driven bar/restaurant/music hall/future-microbrewery run by a group of musicians and music lovers. 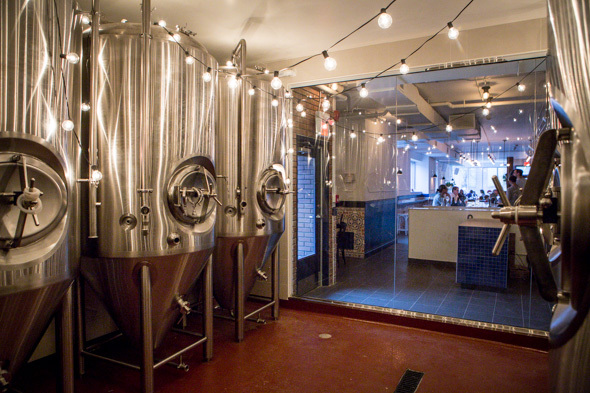 Inspired by Montreal's well-loved bar/bistro/music venue Casa del Popolo , the former churrasqueira has been split into two deep rectangular spaces: upon entering, there is the restaurant/bar/future-microbrewery, and a door on the left leads to the music hall. 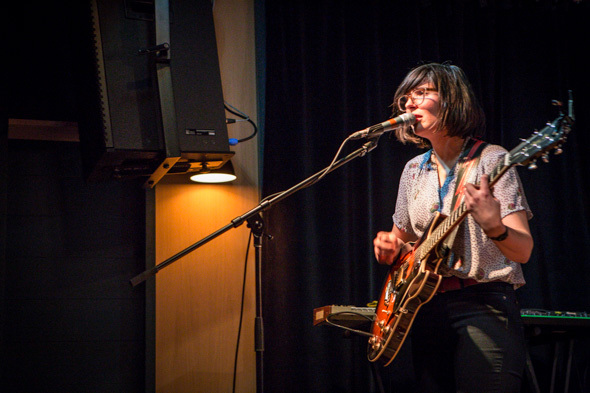 Charlotte Cornfield, the hall's booker, aims to program a wide variety of quality music. Since Cornfield and Underhill are musicians themselves, they understand the wants and needs of those who play here. 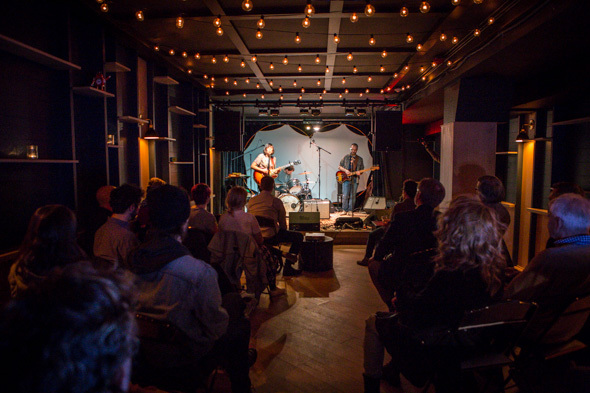 The custom-designed, acoustically isolated hall is relatively intimate - it can hold at least 90 and has its own bar separate from the restaurant's. Back on the restaurant/bar's side, the space feels welcoming and homelike; in addition to smaller tables, there's a communal dining table by the bar, which resembles a wide kitchen counter. 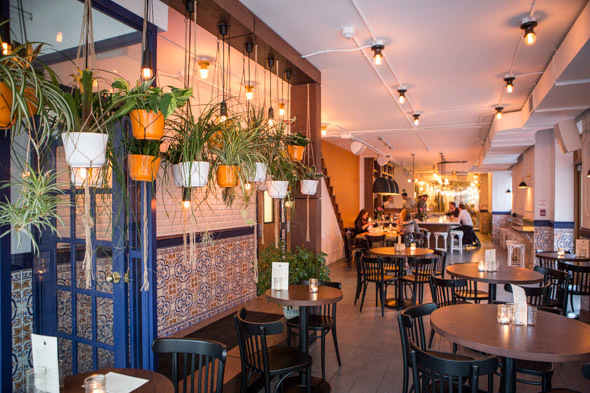 For decor, there are hanging plants, what looks like the side of a staircase leading to nowhere and lovely tiles left over from the churrasqueira. In the back, gleaming brew kettles indicate the imminent arrival of a new microbrewery. 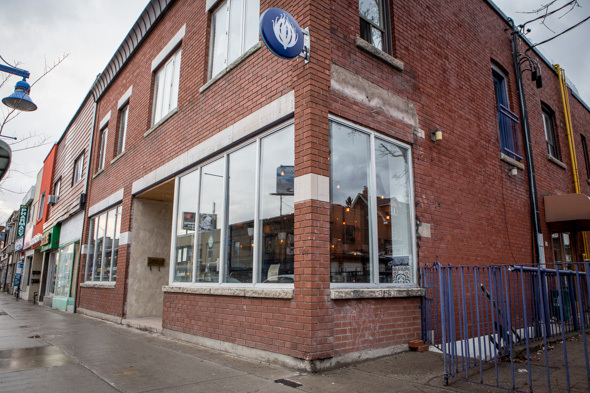 Burdock plans to offer its own craft beers using Ontario yeasts and hops come summertime, with guidance from Brewery Director Matt Park and Lead Brewer David Everitt. 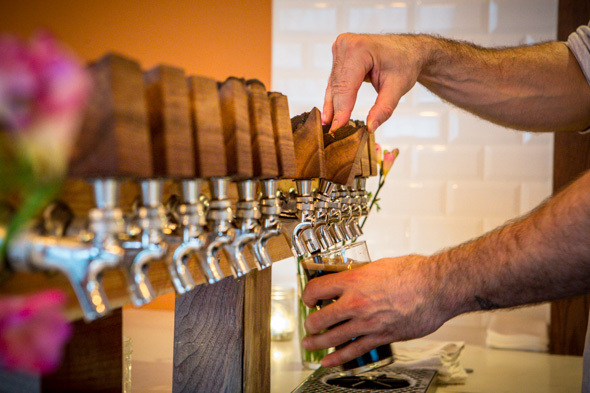 They're offering a rotating list of pale ales, saisons, pilsners, sours and beer-wine hybrids that are all brewed in house. Like the venue itself, the kitchen (open 'til 11pm daily) is helmed by a hyphenate. Jeremy Dennis ( Woodlot , Chantecler ) is a chef/musician/homebrewer, making him a perfect fit for Burdock - and vice versa - as this place incorporates everything he loves. Chef has created a multi-format menu of contemporary Canadian fare using local, seasonal ingredients when possible. A majority of it is vegetarian and can be converted to vegan if necessary. 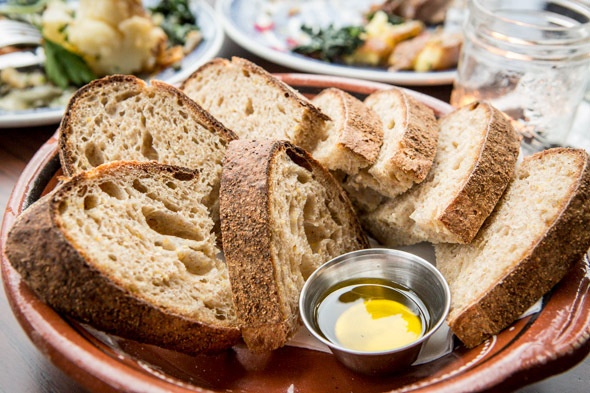 Bread and olive oil ($4) is a given, seeing as how Dennis used to work the graveyard shift at Woodlot as a breadmaker. The hand-mixed sourdough with stone-ground spelt, rye and cornmeal has a good story behind it: the starter is from Woodlot, and was brought over there by its head baker Jeff Connell from St. John's Bakery . Legend has it that it's originally from France and is over 100 years old. Dennis has come up with snacks that he would want to eat while drinking beer. His inspiration for Dufferin Doubles ($5) came from the countless times he's eaten doubles from Patty King (now known as Golden Patty) while downing beers at Ronnie's Local in Kensington. 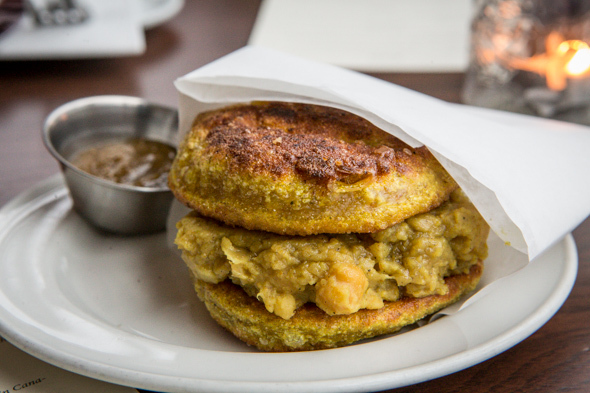 His take on the Trini treat involves curried Saskatchewan chickpeas and onions sandwiched between pan-fried sourdough bara that uses the same starter as the bread. The two flavourful doubles come with a not-too-spicy fermented jalapeno dipping sauce. 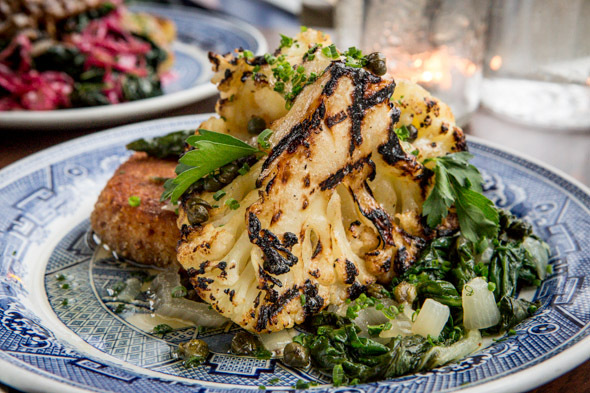 For mains, there's a charred cauliflower ($15) served with a sweet potato croquette and swiss chard. This makes for hearty comfort food, with a nice mix of salty capers, a touch of sweetness from the croquette, plus a satisfying taste of butter, oil and char. 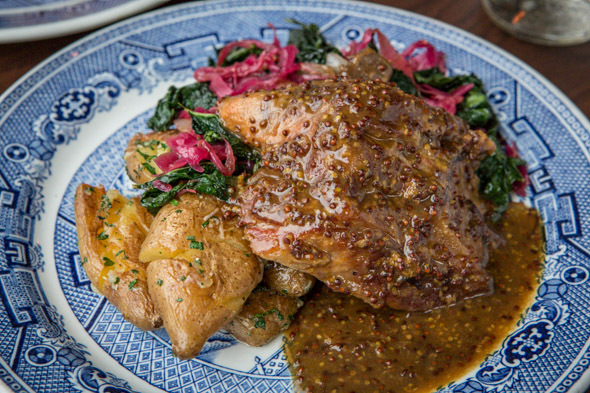 Following this hearty, home-y theme is the ale roast pork shoulder ($15), one of only two meat dishes on the menu. It's amusingly described as "a gnarly hunk of mustard and ale-slathered slow-roasted pork shoulder," and it's served with sauteed sauerkraut (yum), black kale and smashed potatoes. The "gnarly hunk" is super tender and a pleasure to eat, as everything is perfectly seasoned. Locals are starting to discover the spot, and it should become even more popular when the side patio opens up. The crowd transitions from older couples and families dining with kids in the early evening to a 20-to-30-something demographic after 10pm looking to catch a hot band or live DJ set. It seems Burdock wants to be all things to all people, and surprisingly enough, it may just succeed. Join us this April for five true, personal stories about finding your path with or without science. Full lineup to be announced soon. Hosted by Misha Gajewski and Jesse Hildebrand.